Better known as the source of tens of thousands of undocumented children smuggled to North America in recent years, Honduras also has a long history detaining foreigners transiting its territory, at times with support from the United States. The country reportedly detained 2,526 migrants in 2013 and 1,198 in in 2012. Honduras has one of the highest murder rates in the world, is plagued with very high levels of crime and gang violence, and most of its population is mired in poverty. In recent years, it has seen tens of thousands of adults and children seek the assistance of people smugglers to flee the country; upwards of a million Hondurans (or about 10 percent of the population) live abroad. In 2014, the arrival of thousands of Honduran children at the U.S.-Mexico border sparked a public panic in the United States, and many children and families ended up in hastily established detention centres as they awaited deportation back to Honduras. Honduras also serves as a transit country for people from neighbouring countries as well as so-called extracontinentals seeking passage north. A vast majority of transiting people come from Cuba, but there are also migrants from Nicaragua, Colombia, the Dominican Republic, and India. 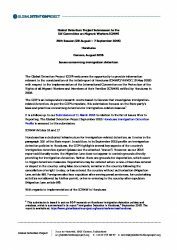 Undocumented migrants are subject to detention even though the country’s immigration legislation fails to clearly provide for this practice. According to statistics provided by the Migration Directorate the country detained 2,526 migrants in 2013 and 1,198 in 2012. The main countries of origin of detainees are Cuba, India, Bangladesh, Somalia, Peru, Ecuador, and Bolivia. The country’s migration policy is provided in the 2003 Migration Law (Ley de Migracion y Extranjeria) and the 2004 Migration Regulation (Reglamento de la Ley de Migracion y Extranjeria). Both the Law and Regulation are vague on the issue of detention. The only provision that explicitly mentions immigration detention is article 8(16) of the Migration Law, which describes the responsibilities of the Migration Directorate (Dirección General de Migración y Extranjería), recently rebranded as National Institute for Migration (Instituto Nacional de Migracion). One of its responsibilities is to temporarily detain (custodiar, literally “to guard” or “to keep”) migrants in special assistance centres (“centros especiales de atencion”) while their migration status is being decided or deportation or expulsion organized. Grounds for deportation and expulsion appear to indirectly serve as grounds for detention. Under the Migration Law, deportation may be ordered when: a non-citizen has entered or stayed in the country using false documents; remains in the country following the cancellation of a right to stay; or has entered the country without authorization (Migration Law, article 88). Foreigners also face expulsion after serving penal sentences, for undertaking activities not allowed by his/her permit, or for re-entering to the country after expulsion (Migration Law, article 89). The law fails to provide a maximum length of detention. However, authorities interpret some provisions of the Migration Law, which are unrelated to detention, to limit the length of detention to 90 days. In practice, however, migrants tend to be detained for two to four weeks. There are no alternatives to detention, in law or in practice. The Migration Law also fails to provide any detention-related procedural safeguards. Observers in Honduras told the Global Detention Project that in practice detained migrants are informed about reasons for their detention and have access to a lawyer, paid by them, if they request. However, in the majority of cases, the only legal advice given to detainees is provided by civil society organizations. Some migration officers speak English and can help detainees understand the process; however, this practice is not systematic or predictable. The only possibility to appeal detention is to bring habeas corpus action. Yet, such appeals are extremely rare in practice. There is no automatic review of detention. Honduras operates two dedicated immigration detention facilities. Like its neighbours, the country employs euphemisms to name these centres, which are officially called Centros de Atención al Migrante Irregular (CAMI), or “Irregular Migrant Attention Centre.” (Nicaragua, for example, calls its facility the “Migrants Shelter Centre.”).The centres are located at the premises of the Migration Directorate in Tegucigalpa and Choluteca. Before opening the centres around 2010, migrants were already detained in these facilities, however in an informal manner. Both centres have a capacity to detain approximately 20 migrants but usually there are no more than 10 people on a given day. Men and women are detained separately. Minors, following a short period of detention while their age is determined, are released from the centres and placed in care centres managed by the National Directorate for Children and Family (Dirección Nacional de la Niñez y la Familia). If a child travels with his mother, they are both placed in a care centre. According to GDP sources in Honduras, the cost per detainee per day is around 12 USD (this includes only food, drinking water, and items of the basic hygiene). Reportedly the conditions of detention are very basic, both in terms of food and equipment of the centres. In general, authorities tend to allow visits by civil society organizations. The Ombudsperson, who is authorized by law to monitor all the places of detention in the country, visits the centres on rare occasions. Observers have criticized the United States for pressuring Honduras and its neighbours to detain transiting migrants because it is cheaper. A case in point was Honduras’ involvement in U.S.-led anti-smuggling operations during the 1990s and 2000s called “Operation Disrupt,” which targeted migration and smuggling activities in the Dominican Republic, Costa Rica, Ecuador, Honduras, and Canada. In 1997, when “Disrupt” anti-smuggling operations were subsumed under the rubric a larger U.S. initiative called “Global Reach,” U.S. immigration officials significantly broadened the scope of their Latin American activities. These included undertaking annual multilateral interception operations with law enforcement personnel from dozens of Latin American countries. According to activists in these countries, during the operations, U.S. immigration agents accompanied local authorities to restaurants, hotels, border crossings, checkpoints, and airports to help identify and apprehend suspicious travelers. In a series of yearly press statements in the late 1990s and early 2000s, U.S. authorities proudly announced the results of each operation. In 2000, for example, the INS (U.S. Immigration and Naturalization Service) declared that year’s Disrupt operation, “Forerunner,” to be the “largest anti-smuggling operation ever conducted in the Western Hemisphere.” Involving agents from six Latin America countries, the operation nabbed 3,500 migrants and 38 smugglers. Forerunner was followed in 2001 by “Crossroads International,” which the INS again described as the “largest multinational anti-smuggling operation ever conducted in the Western Hemisphere,” this one resulting in the arrest of 75 smugglers and the interdiction of some 8,000 migrants from 39 countries. “The wide-ranging anti-smuggling operation was directed by the INS Mexico City District Office and involved … law enforcement officers in Columbia, Costa Rica, the Dominican Republic, Ecuador, El Salvador, Guatemala, Haiti, Honduras, Jamaica, Mexico, Panama, and Peru,” said a press statement. Telesur, “Migrant Mothers, Children Could Be Freed from US Detention,” 12 May 2015, "http://www.telesurtv.net/english/news/Migrant-Mothers-Children-Could-Be-Freed-from-US-Detention-20150512-0004.html"
 Undisclosed source. Phone calls with Izabella Majcher (Global Detention Project). September 2015. Undisclosed source. “GDP Questionnaire on Honduras.” September 2014. Undisclosed source. Phone calls with Izabella Majcher (Global Detention Project). September 2015. Hondudiario. "ACNUR conocerá causas de migración hondureña a Costa Rica." 29 January 2015. http://www.hondudiario.com/?q=node/16656. Undisclosed source. Phone calls with Izabella Majcher (Global Detention Project). September 2015. Undisclosed source. “GDP Questionnaire on Honduras.” September 2014. Undisclosed source. Email exchange with Izabella Majcher (Global Detention Project). September 2014. U.S. Conference of Catholic Bishops (USCCB). 2000. “Statement on Visit to Central American Nations of Guatemala, El Salvador, Honduras.” 10 November 2000. For more detailed information about these anti-smuggling operations, see Michael Flynn, “There and Back Again: On the Diffusion of Immigration Detention,” Journal on Migration and Human Security, 2014, http://jmhs.cmsny.org/index.php/jmhs/article/view/31. Michael Flynn, “Donde Esta La Frontera,” Bulletin of the Atomic Scientists, July/August 2002, http://www.globaldetentionproject.org/fileadmin/publications/Flynn_frontera.pdf. U.S. Department of Justice (DOJ). 2000. “INS and Central American Governments Disrupt Alien Smuggling Operations.” INS Press Release. October 17, 2000. U.S. Department of Justice (DOJ). 2001. “Largest Multinational Alien Smuggling Operation Results in 7,898 Arrests in Latin America and Caribbean, International Cooperation of 14 Nations Called Key to Success,” INS Press Release. June 27, 2001. Undisclosed source. 2014. Global Detention Project Questionnaire: Honduras. September 2014. Ley General de Migración y Extranjería, Decree 208-2003. 3 March 2004. Article 8(16). Ley General de Migración y Extranjería, Decree 208-2003. 3 March 2004. Article 88. Ley General de Migración y Extranjería, Decree 208-2003. 3 March 2004. Article 89. Report of the Working Group on the Universal Periodic Review: Honduras. 12 May 2015. A/HRC/WG.6/22/L.9.